I was born in Camaguey Cuba, and moved to Madrid Spain at an early age. I grow up with a sixteen-year-old mother, so I had a lot of fun in my childhood days. My mother was a voracious reader and an Animal Lover. She will bring home any animal that she found in the stress to protect them. We did not own a TV and even today I do not own one. I learned about Fauna and other subjects through my mother books, many of which were photographs books. I developed a profound admiration for the animal photographers. Later in life I chose an artistic path and completed my studios in Music Performance back in Madrid Spain. My music career ended after a few years of Trombonist Modeling. I was the cutest trombonist in the country so I make my living working on TV Shows pretending that I was playing or making soups as we called in Spain. At the beginning of the Millennium I joined my father In Miami, United States, to catch up with technology and the English Language. I completed some college on Web Design here in Miami. When I was in college, I noticed that it was very common for musicians to hold a desired to express themselves-through visual arts, and I was not an exception. Without any doubt digital technology is an accessible miracle that offers everyone a window of opportunity to express themselves. I LOVE DIGITAL TECHNOLOGY. Later in the middle of a financial struggle I became a Pet Sitter. I built a small local business to go through a temporary period of chaos and loss. For the first time in my adult life I felt that I was in the right spot, and I was. My decision Flourished very naturally and I realized that I was sharing the best side of everyone. Now I take many animal pictures, but I am more skilled in Digital Design. My respect and admiration for animal photographers and artists has grown since I understand the level of dedication that it implies. That allows the artist and the visitors to co-create. In this quest I have found many friends and support at the Groups in Fine Art America. 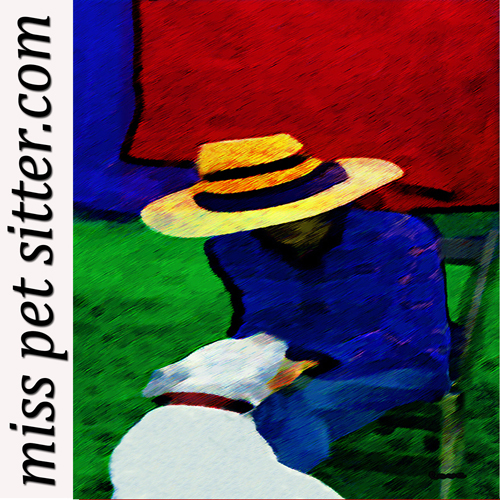 Soon I will be sharing other Animal Artist and Photographers with Miss Pet Sitter Clients. It is a wonderful ambient, full of animal lovers and artist. This is a Digital -Art Kingdom. And thank your all for visits . I learned something when I became a Pet Sitter. You can make a living doing what you love.